Effing Delicious: Drawing with icing is hard. Drawing with icing is hard. Ha. Not so much. 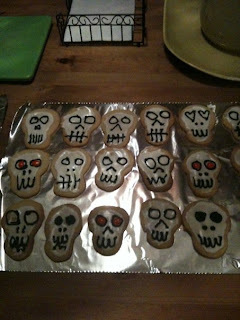 In fact, after baking these sweet skull-shaped sugar cookies for my darling cousin Chloe’s sweet 16 birthday this weekend, and beginning the decoration process, I almost scrapped the whole project. When I first started spreading the gooey white tubed background icing, I knew I had sorely underestimated the difficulty of this task. And when the first skull face came out looking like a blind monkey had drawn it, I had a mini internal temper tantrum. But as it turned out, the learning curve wasn’t so bad (I’m still no expert), and the project was ultimately fun and yielded cute if mediocre visual results…but rather than the goofy skull faces I felt like the real star was the crispy buttery sweet cookie itself. 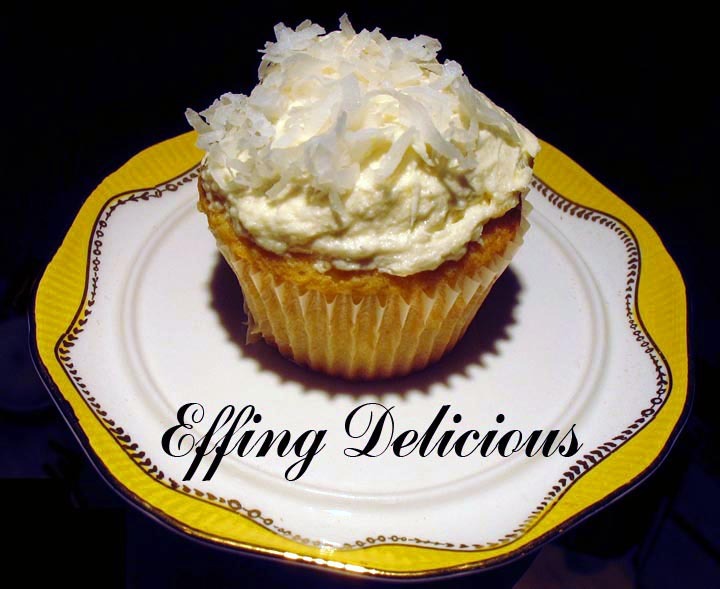 I’m still not 100% cool with the creepy processed store-bought icing I used - I considered making my own, but that would have been an ordeal unto itself. Its super sweetness, however, did not kill the buttertastic glow of these amazing, simple lil cookies…rather it enhanced it, in a junk-food-you-used-to-love-as-a-kid sort of way…apropos. Preheat oven to 350˚. Mix butter, egg and vanilla until very well combined (in stand mixer if you wish, but totally doable by hand). Combine the remaining dry ingredients in another bowl (except the icing of course), then fold into wet ingredients. Wrap dough in plastic wrap and refrigerate until chilled, at least 45 minutes. Generously flour a clean work surface. Roll dough out to desired thickness. I think these cookies work best on the thin side, to create an addictive buttery snap. Cut out skulls or other desired shapes* and place on cookie sheets lined with parchment paper. For thin cookies, bake 8-10 minutes; for thicker 15 minutes. You’ll know they’re perfect when they just start to brown around the edges. Let cookies cool on wire racks for 15 minutes. When cool, decorate with icing, and good luck to you! The only advice I can give you is to take a deep breath, apply consistent pressure to the tube, and get kind of zen about it. Let the icing harden before stacking so as not to destroy your labor of sugary love. *Now that I’ve done this I’m thinking of all sorts of other awesome shapes to make cookies in…today’s thought was Dharma Initiative symbols from Lost. And check out these hilarious Lady Gaga cookies! The best brunches last all day.